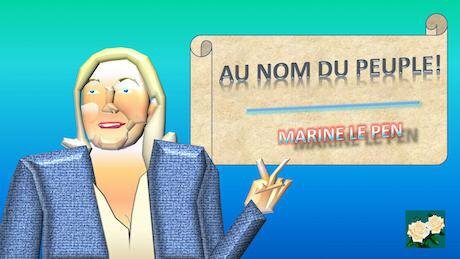 Marine Le Pen 2017, Au nom du peuple. (In the name of the people). Flickr/Richard Grandmorin. Some rights reserved. This book is a difficult read. It is a mixture of selective facts and figures combined with data from opinion surveys and Goodhart’s own assertions and value judgements. At times the writing is elusive and hard to pin down. But in a fast-changing world where social democracy has lost its way, the book’s underlying narrative serves as a manifesto to deliver readers into the arms of the country’s nationalist Right. To those of a progressive and social democratic persuasion it is both dangerous and divisive. Goodhart asserts that the country is divided into three blocs: the Anywheres who went to university and have a broadly liberal individualistic outlook; the Somewheres who live close to their place of birth, did not go to university and have a sense of rootedness and identity that the Anywheres have lost; and the In-Betweeners. He asserts that the Somewheres represent broadly half the population and the other two a quarter each. He maintains that it is the Anywheres who have dominated British life for the last few decades, increasingly since the onset of the Blair government. Brexit represents the revolt of the Somewheres against this dominance. The In-Betweeners are referred to initially but then rarely get a look-in. For Goodhart the world is basically divided between the Anywheres, “the upper professional class” with their global world outlook and the Somewheres, with their preference for place, stability and nation. These are Britain’s ‘two value blocs’ and the book is a paean of praise for the preferences and prejudices of the Somewheres. There are many flaws with this story. Firstly, class. Goodhart generally avoids the term but his Somewheres are clearly the working class while those Anywheres who go to university are lumped together as “the upper professional class” even though this includes everyone from those who go on to do low grade office and administrative work through to hedge fund managers and senior executives. Apparently the three years at university are sufficiently formative to mould all these diverse people into one homogenous bloc with common values that inform and shape their future political outlook. Jesuits would be envious indeed of the influence of university Vice Chancellors, were it so. “the upper professional class”… includes everyone from those who go on to do low grade office and administrative work through to hedge fund managers and senior executives. Goodhart does concede that within this Anywhere grouping there is a subset of ‘Global Villagers’ who form around 3% of the total population and who constitute the key movers and shakers. Here he gets closer to the class realities of the twenty-first century world. Indeed, he makes some points not dissimilar to those made by the Occupy movement about the 1%. Yet there is no evidence to show that it is their university experience that shapes and informs ‘Davos man’. Was it crucial to the emergence of Rupert Murdoch, the most archetypal Global Villager that you could find and the most influential man in Britain, who merits not a single mention in Goodhart’s book? Or the Barclay Brothers, or Arron Banks? 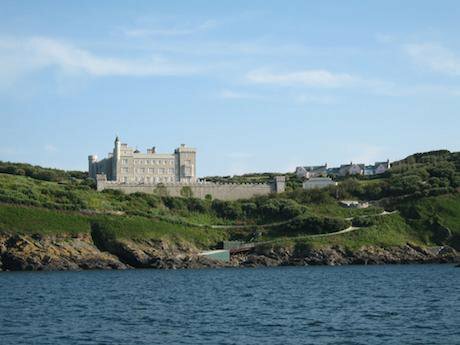 Brecqhou - Barclay Brothers' Castle, 2009. Wikicommons. Public domain.Secondly, Goodhart substitutes cod sociology for politics and in the process has constructed a false thesis. The last four decades have seen a political project of concerted neo-liberal globalisation initiated by Ronald Reagan and Margaret Thatcher and accelerated after the fall of the Soviet Union under the leadership of Bill Clinton, George W. Bush and Tony Blair. Goodhart rightly criticises some of Blair’s more outrageous hyper-globalisation rhetoric. But he fails to recognise neo-liberalism as an Establishment project – by the Global Villagers to use his term – designed to take advantage of the ICT revolution and the collapse of the USSR to create a new model of rampant, financial capitalism. The last four decades have seen a political project of concerted neo-liberal globalisation... accelerated after the fall of the Soviet Union under the leadership of Bill Clinton, George W. Bush and Tony Blair. Instead he lumps all progressives, liberals and professionals into what he terms this Anywhere agenda. He gives a list of measures that “go with the grain of Anywhere thinking” which range from no intervention in the UK on takeover deals by foreign companies; support for universities to raise their student fees to £9,000; and military intervention in Iraq. (page 225) This is completely absurd. These were all part of the neo-liberal world view. Their most ardent advocates were to be found in the editorial pages of our Brexit-supporting, national press, a point completely absent from Goodhart’s book. Didn’t Anywheres form part of the huge demonstrations of opposition to the Iraq war? Weren’t the Liberal Democrats punished by large numbers of ‘Anywhere’ voters at the 2015 election precisely because they had supported the imposition of huge increases in student fees? The Anywhere/Somewhere divide is a fake construct designed with a purpose, namely to suggest that there is an unbridgeable gulf between the working and professional classes. The Anywhere/Somewhere divide is a fake construct designed with a purpose, namely to suggest that there is an unbridgeable gulf between the working and professional classes. 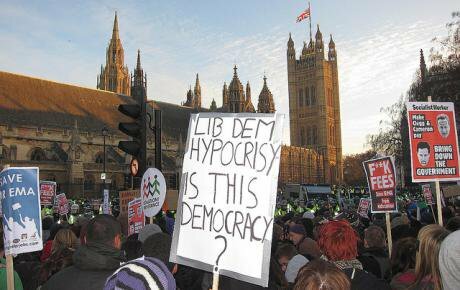 Student protests over fees, Parliament Square, 2010. Flickr/Bob Bob. Some rights reserved.This relates to Goodhart’s third flaw, that somehow there is an essential, unchanging bedrock of common sense, natural and patriotic values at the core of the working class, which Anywheres do not understand. Yet even Goodhart is forced to admit that there have been immense social changes over the last forty years in relation to gender, race and sexuality and that these have occurred across the whole class range. Goodhart tries to shoehorn this into his Anywhere/Somewhere prism (pp40-41) but the reality is that vast swathes of the population have shifted their attitudes over this period and that the crucial determinant has been age. Not surprisingly, the slowest rate of change has been amongst the oldest. Fourthly, Goodhart’s justified concerns about globalisation blind him to the economic realities of today’s world. He tries to find facts and figures to suggest that these trends are not that substantial. He is burying his head in the sand. With the emergence of the trans-national corporation, modern ICT, mass transport and the opening up of the old Communist blocs there has been a huge surge in cross-border commercial activity. Economics has leapt the boundaries of the nation state in all medium-sized and small countries. Up to 10,000 freight vehicles a day pass through Dover. Around 4.4 million lorry journeys are made between the EU and the UK each year. The UK forms part of an integrated single market economy, which is why those proposing a hard Brexit are being so reckless. Goodhart seems to find it hard to conceive that a person can recognise this, approve of European integration and yet still retain a national and local identity. Many of us have multiple identities and in an interdependent world these increasingly reflect reality. As the Green movement – largely ignored in this book – expresses it, ‘think global, act local.’ There is no gulf between the two. Most people can ‘walk and chew gum’ at the same time. The UK forms part of an integrated single market economy, which is why those proposing a hard Brexit are being so reckless. Many of the ills that his book addresses arise from the project of neo-liberal globalisation. Under Clinton and Blair’s influence much of European social democracy signed up for this hyper-globalisation model and are now suffering the consequences of their love affair with neo-liberalism. Yet Goodhart fails to see that there are a range of potential models of globalisation. If social democracy is to survive as a political force across Europe it has to connect with the inter-dependent realities of the modern world while applying the core values of liberty, equality and solidarity to them. That means a clear acknowledgement that New Labour’s infatuation with a neo-liberal model of globalisation including its attachment to unmanaged migration did profound harm to both social democracy as a political philosophy and to the traditional alliances between working class communities, the public sector and the liberal intelligentsia that formed the basis of its winning coalitions. Any social democratic project has to repair that damage. Any social democratic project has to repair that damage. There are multiple ways to reconnect social democracy with the working class and its diverse communities and display a genuine commitment to towns and localities. Goodhart suggests a few, notably on apprenticeships but fails to mention some obvious ones. Shedding the disdainful term ‘Old Labour’ would be a symbolic start. If you want to support policies that help working class and poor households then defend the Sure Start programme, a Labour achievement that goes unmentioned by Goodhart. He does not mention these vital community centres because basically he prefers women or grandmothers to look after the kids. Reverse the cuts to the Educational Maintenance Allowances that allowed 16-18 year olds from poor households to stay on at technical college with a grant. Attack the concerted austerity drive of the Cameron government which removed the youth and community services that served tens of thousands of young people in deprived communities. Above all, stop the endless reductions in local authority budgets that mean that adult social care is pruned to the bone, that basic home help and care services are now outsourced with an increasing use of zero hour contracts and 15 minute visits. Since 2009-2010 it is local authorities in the poorest and most deprived parts of the country that have taken the biggest hit on austerity and the services that they provide to working class communities that have been undermined along with the professional pride of the care staff. Yet Goodhart makes no mention of this concerted austerity drive as it does not fit with his narrative. Since 2009-2010 it is local authorities in the poorest and most deprived parts of the country that have taken the biggest hit on austerity. Even where he makes sound arguments he fails to draw the obvious conclusions. He notes that Germany has a different model of capitalism; that workers are represented on the boards of its large companies; that organised labour has helped to slow de-industrialisation and retain a strong technical and vocational training ethos. But there is not a word about trade unions in Britain. He makes no proposal to reform the anti-trade union laws of the Thatcher era that Labour was too scared to challenge. Whenever one hears claims by politicians and commentators to be concerned about the working class there is one simple way to gauge whether they are genuine. Do they support the right of workers to combine together and join a trade union? Will they make it easier for workers in trade unions to gain official recognition from their employer? Will they remove those measures that restrict a union’s capacity to take action against their employer? If Goodhart genuinely wants to shift the balance of power within the economy to those with relatively little economic clout, then these are the steps that he would promote. These would challenge employers like Sports Direct and help workers to gain decent pay and conditions through their own actions. On this, he is silent. 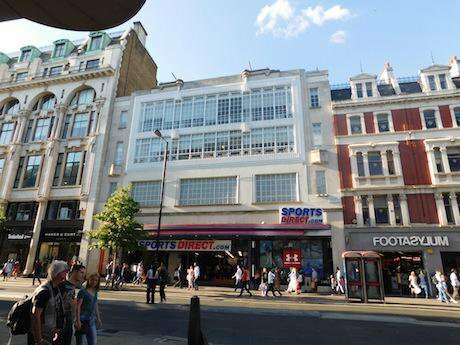 Oxford Street: Sports Direct, 2016. Wikicommons/Paul the Archivist. Some rights reserved. Whenever one hears claims by politicians and commentators to be concerned about the working class there is one simple way to gauge whether they are genuine. Do they support the right of workers to combine together and join a trade union? Goodhart’s overriding flaw is to assume there is only one type of globalisation and that the only counter to it is nationalism. In this he follows the route of Trump and Le Pen. His ‘road to somewhere’ will end up in a similar place. This helps to explain why the author uses kid gloves in describing them. To readers who think that is a harsh judgement then the section on the hard Right should dispel any illusions. Most are “decent populists”, “populism is the new socialism”, “UKIP and the Front National have been dragged sharply to the left in recent years.” Then there is the genteel language used about Donald Trump. In some of his campaign speeches Trump did “nod towards” white America’s anti-black traditions. He ”joined in” the campaign about Barak Obama’s birthplace, whereas in fact he was its main advocate. “He is not a white supremacist” but he just appoints one – Steve Bannon – as his top adviser. 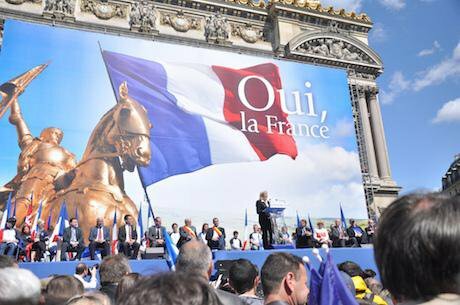 Meeting, May 1st, Front National, France, 2012. Flickr/Blandine de Cain. Some rights reserved. Goodhart’s overriding flaw is to assume there is only one type of globalisation and that the only counter to it is nationalism. Thus, it is not surprising that Goodhart proposes a reactionary policy menu built around traditionalist, socially conservative and nationalist policy themes unified around the scary Blue Labour slogan of ‘flag, faith and family’ with its eerie Nazi era echoes of ‘Kinder, Kuche, Kirche.’ Having demonised the progressive middle class, Goodhart cuddles up to “the decent populists.” A few years ago Goodhart described himself as ‘a social democrat.’ In this book he is ‘from the Radical centre.’ He is certainly on the road to somewhere. But it is not a destination that any progressive or social democrat should follow. I see Melanie Philipps and Arron Banks thumbing a lift on the road ahead.